We are doing dozens of fracture repairs now. Virtually every case of a severely animal that comes to us (now four per week) has resulted from an motor vehicle accident in which the driver did not stop to lend a hand or make a call for assistance. The animal was left to suffer or be killed by further vehicles or foxes. Their chance of being helped in most cases rests in the hands of other more caring drivers in the immediate vicinity. Thanks to the help of amazing wildlife vet Dr Howard Ralph - http://www.southerncrosswildlifecare.org.au - Trooper will be free again soon. First step: In any macropod rescue where there is significant injury you need to give sedation and importantly pain relief. Animal Valium (Pamlin) is not enough for pain relief. We give injectable Tramil. If the injury is minor you could get away with children's Painstop, but its not enough for a fracture. This treatment is important if there is no veterinarian immediately available. If the injury is a fracture, then splint support to stabilise the fracture may be required as the best form of pain relief. We give injectable Vitamin E and Selenium to reduce the risk of myopathy. Second step: Have an assessment of the injury and decide whether it can be treated. Things to consider here are the type of injury (where the fracture is and what kind of fracture it is – an x-ray may be needed at some point), size of the animal and whether you have the facilities and knowledge available for the long term rehabilitation phase. Larger animals may be more difficult to manage in the rehabilitation phase but of course it can be done and we do it all the time. Third step: Either take the animal to a veterinarian for treatment or undertake at least some of the treatment yourself. A course of antibiotics will generally be needed. We use Betamox LA and Baytril together to cover as wide a spectrum of infection as possible, initially. Fourth step: If you are carrying out some of the treatment yourself if you know what you are doing with a limb fracture. Under strong sedation (Pamlin may not be enough here and you may need Xylazine) and pain relief you may need to put traction on the limb to bring the bones into alignment if they are displaced or compound, clean the wound site with saline and Betadine or similar, splint and bandage with the leg in alignment with the toe and sitting in either the right angle position or slightly dorsiflexed. The rest will be up to the veterinarian once the x-ray has been seen. I haven’t given any medication dosages in the above but could do so if needed. Hope this is helpful. We do many of these for animals we rescue ourselves or that others bring to us. However generally if the animal is large and the fracture is substantial and complex, we probably would not try to rehabilitate. Large animals are difficult to manage in rehabilitation if the fracture is significant. As I travel through the Australian bush I find myself apologising for being human to all the wildlife I come upon. And if you could hear a distressed animal’s quiet sobbing…what would you do? Judge your life not by how good you are, but rather by what good you do. Easy to kill kangaroos but excessively tight laws about keeping them as pets. People don't usually eat pets, so it's a conflict of interest for the kangaroo meat trade. Humans make me puke. Read the below. Justice is a joke in this country. A HERVEY Bay man has lost his latest appeal to keep a pet kangaroo his daughter raised from a joey, after finding the roo's mother dead on a road at Mitchell in Western Queensland. Colin Raymond Candy took his decade-long battle to the Court of Appeal and argued his red kangaroo, named Mitchell, was not a protected species and his property was not a protected area. Mr Candy argued the red kangaroo had been declared a pest and could be killed as game for sale as meat. He also argued the kangaroo was his property and Queensland Parks and Wildlife Service officers "stole" him from his home in 2001. Mr Candy told the court the kangaroo would come to his name, even when they were out in the bush for the day. He initially had a permit to look after the orphaned joey but did not seek a new permit when that expired. Mr Candy took the Court of Appeal justices to the Native Title Act, Fauna Conservation Act, Meat Industry Act, the Rural Lands Protection Act, Animals Protection Act and sections of the Queensland Parliament Hansard record. Justice Anthe Philippides, in a judgment handed down in the Court of Appeal on Friday, said the decision to dismiss a judicial review of the original red kangaroo permit refusal was sound. "None of the matters raised by the appellant by way of other legislation or other matters are of any substance whatsoever and no basis has been demonstrated for departing from the above decision as wrong in law," she said. As a principle, no more species of wildlife should be kept as pets. We already know the horror of death-rows, battery breading, abandonment and cruelty associated with the pet trade. 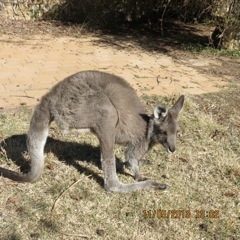 However, this is a rescued joey that has bonded with its adopted family. It would have little fear of humans, and it's fate would be sealed if it were released into the "wild". The joey would either end up killed on the roads, "managed" by being culled, chewed by feral dogs, or be "harvested" as part of the meat trade. All our laws are swayed against keeping kangaroos as our companions, even those that can't be released. The best idea would be to send the joey to a safe reserve nominated by wildlife carers. The laws are draconian and unbending. Fools make these laws, with no heart or flexibility. Pets that have been saved, not wildlife pets! I can't see why the man couldn't keep it, as said it now no longer fears man. How heart breaking for them. Parks and wildlife are great at enforcing these laws, but wont help us wildlife carers stop 1080' non professional culling, and acts of horrific cruelty on our wildlife by MOPs. Aren't there more pressing issues in Hevey Bay than taking away a kangaroo that has been saved from death and now was being looked after with much love and right conditions, other wise it would of died of myopathy by now.